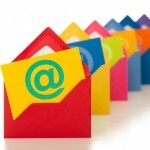 E-mail marketing – still popular! Many people think that e-mail marketing has died and doesn’t bring any profit. It annoys people and forces them press “SPAM” button. But research held recently by Listrak and Harris Interactive confirmed that email marketing remains one of the best ways to attract public interest and generate sales of products or services. This research concluded that more than two out of five U.S. adults (41%) have made a purchase in the last 6 months as a result of receiving an email from a retailer. • Email is still one of the best means of communication with potential consumers. 97 % of Americans receive emails from retailers, and more than eight out of ten U.S. adults (83%) who receive those emails open them. • Targeted subject lines contribute increasing email open rates. U.S. adults are more likely to open an email that is specifically targeted than generic ones. For instance, more than a half of U.S. adults (53%) who open emails from retailers say that they open emails only with the special offer subject lines. The rest say they would open an email in order to confirm their order (47%). • The mail users who purchase using email are middle-aged tech-savvy consumers. Mail consumers over 55 have made more purchases due to e-mails than men age 18-54 (38% vs. 26%) within the last 6 months. To sum up, Email marketing remains one of the most cost-effective ways to communicate with the customers. It is much cheaper than traditional mass mailings. In comparison with traditional advertising, such as context, or banner advertising, Email marketing can promote immediate sales and develop long-term customer-relationship. • Why an e-mail? Because it’s usually personalized. The most beautiful music for anybody is their name. And when somebody receives a letter on his name, he would rather be interested in it than not. • It’s not spam as people have subscribed to your newsletter. • E-mail is free excluding various expenses for printing, shipping, etc. • The consumers prefer this means of communication as e-mails may be not only for advertising purposes but as well provide customers with useful information. • According to the results of how many e-mails were read the overall effectiveness of the campaign and consumer interest in proposal can be assessed. • The only thing necessary to succeed in e-mail marketing is to create “attractive e-mail” so that many consumers would subscribe to it. • People usually go online to find out some information. And if you fail to express your thoughts clearly, beautifully and elegantly you won’t be able to succeed in the Internet. • If you are unaware of your consumers’ expectations and what the reaction on your offer might be – then think it over before sending an e-mail. • One of the main problems of e-mail newsletters is that nowadays Internet users have high-spam filters, and it significantly increases the possibility your marketing message would get into the basket instead the inbox. So, sending marketing e-mail messages, you should keep in mind that spam filters usually detect the words like «absolutely free», «shares», «discount» in the message body and subject line. If done properly, email marketing can prove to be very powerful and effective marketing technique. It allows buyers and sellers to communicate with each other and develop relationships based on trust. Have a look at the example. You receive a letter. What would you do? Commonly, you would push «SPAM». Because 90% of all the e-mails you receive is junk-mail. 7% of e-mails are personal letters, and only about 3% e-mails contains important and useful information. So, only in 10% of cases we click «Accept». If Email marketing is done properly, this percentage increases significantly. 1. Send e-mails only to those people who have confirmed their subscription. 2. Your newsletter should contain only the information the person has subscribed to. 3. Send e-mails regularly (once a week, two weeks, a month) and always stick to it. 4. The best period for sending e-mails to business partners is from Tuesday to Thursday at 9:30 AM or 13:30. 5. In most cases, the best period for sending letters to consumers is between 17:00 and 20:00 from Tuesday to Thursday/Friday night/Sunday afternoon. 7. The sender line should contain your company name. A subscriber has only a few seconds considering if he should open an e-mail or not, and your company name is vital. 8. Make two versions of the newsletter – text and HTML-version. If you send the HTML version of the letter, 5% of subscribers won’t be able to read it. 9. Don’t use caps or exclamations in subject of letter or message body. Otherwise it might be considered as SPAM. 10. Make different subscriptions on different topics. Create a subscription to a newsletter on each topic separately. Subscribers want to get information which they are interested in. And, most important rule of any marketing – good information. Check, if it’s interesting to read your e-mail. Write fun and bright, let people get the information they want to see, and they will pay attention to your product. Especially when this information came directly to them in the mail. Put yourself in the reader place and do not abuse, look objectively at your e-mail. Would you like to open it, read or buy? If there is at least one yes, you are at right way, continue to work. We will continue to discuss the topic of e-mail marketing in the next article. Specifically, we’re going to compare email–marketing services, review them from all sides and draw useful conclusions.